Summer phlox (Phlox paniculata) is a flowering perennial that grows from thick root clumps that are easily divided with a sharp blade in the fall to create more plants. The flowers are held aloft by long stems 24 to 42 inches tall, depending on variety. Colors are purple, blue, white, red, pink and lavender. Phlox is a dependable garden performer, returning every year. It needs occasional watering and light fertilization to look its best. Choose a variety that resists powdery mildew, a major phlox disease. Phlox are suitable for planting in gardens all over the United States. Cut back garden phlox in late spring to six to eight stems per plant when all stems reach 12 inches high. This allows for greater air circulation and forces the remaining stems to produce bigger blooms. Prune back each stem by 1/3 after it blooms with a pair of sharp garden shears. This is a process called deadheading. 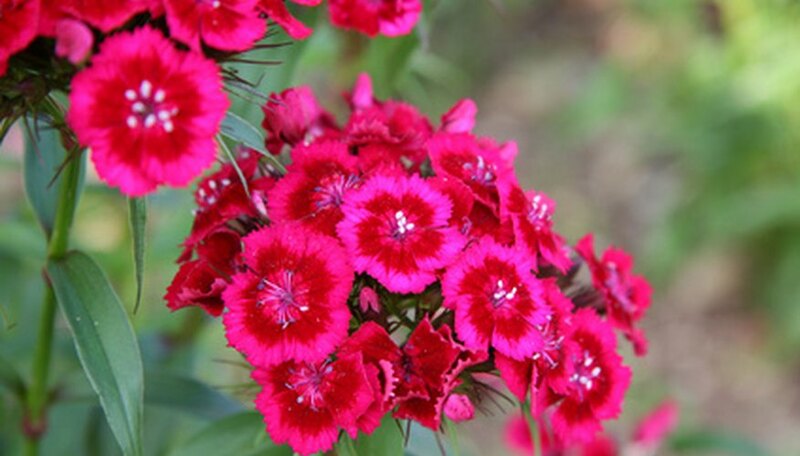 This prevents the plant from using energy to produce seed on that stem after the flowers fade, and provides another flush of blooms on that stem. The new blooms will grow from stems that grow from the area where the main stem was cut. The replacement blooms will not be as big as the original blooms on that stem. Cut back each stem to the ground after the second round of blooms, using a sharp pair of hand shears. This prepares the plant for fall and for winter dormancy. Dispose of old stems because they may contain fungal diseases that might remain in the soil over the winter.